The #AllBlackEverything look is literally everything come winter (you can still wear it during the summer, though! ), the #AllWhiteEverything is just as powerful and classic as it's contrasting counterpart. The thing is, it's not nearly as forgiving as an all black outfit, since it highlights...EVERYTHING, and because of that, it requires more strategic placement when creating a figure flattering ensemble. In order to create an outfit that will place attention where desired most, one must identify her body shape first or think about where she's most confident in all the attention being placed. In other words, where you would't mind appearing larger, since in essence this is the effect that white creates. 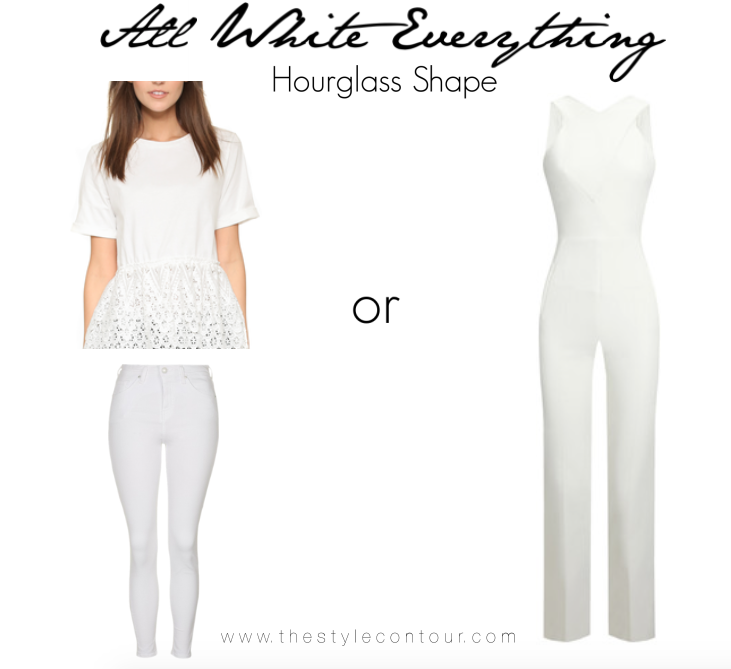 Today, I'm sharing some suggestions on what you can keep in mind when shopping for white pieces or putting your look together in a way that will truly fit and flatter your body shape. So, let's start from the top with the apple! Since you are largest on top (not meaning in size, in proportion! ), I'd suggest avoiding tight tops and/or those with a scoop, ballet, or bardot neckline, which can cause the upper body to appear larger in fullness and width. Instead, looser, flowy styles will drape the body nicely, skimming the surface. A v-neckline will narrow in the wider chest area, while still embracing a fuller bust, if you wish. This shape tends to have lean legs and so, why not flaunt them in a cute romper or pair of shorts!? Rompers that have a wrap front, as seen above, flatter the entire upper body and create the illusion of a defined waist line! The opposite of the apple, you are largest (not meaning in size, in proportion!) in the lower region, so working with white pants can sometimes be tricky, but certainly NOT impossible (I'm a pear shape and wear them all season long)! When opting for skinnies, pair them up with a top that either creates width (think off the shoulder) or dimension to the bust area, which can be easily done with ruffles or frills. They are easier than ever to find these days, since they're trending big this season! Either the width or dimension in these styles will balance out the visual weight that the white pants will create. One thing to keep in mind, though, is if you're also looking to wear white heels, I'd suggest you opt for a stiletto instead of a block/chunky heel style, since it will add more visual weight to the legs, making them appear larger. This shape has notable shoulders and a straight silhouette, so styles that help to soften the shoulder area and/or create visual weight or attention to the legs are great options. Tops like the one shown above, that have a cross neckline with shoulder cut outs, will extend downwards on the arms, causing the shoulders to appear less wide and angular. Ruffles or embellishment are the bust area, can fill in the bust area, adding dimension and create the illusion of curves. This particular body shape also looks great in one pieces, such as rompers or jumpsuits, mainly because the body as a whole is fairly proportional and these two styles often create a defined waist area, which prevents the body from appearing linear. Also, one of the most flattering necklines on a one piece, for this particular shape, is a halter style, since it once again, creates smooth angles to the upper body. Lastly, this shape is symmetrically on both the top and lower portions, so the key is to maintain those proportions by working with more simple styles that allow your curves to be highlighted as a whole. Peplum tops or those with details on the lower hem are figure flattering and will further enhance the hip area, which works well with this shape, if the rest of the top is left relatively simple. As with the rectangular shape (these two are very similar) one pieces look great on you because they highlight the entire body. I'd suggest you opt for styles with clean lines, while exploring various necklines, the most romantic being the off the shoulder/bardot. 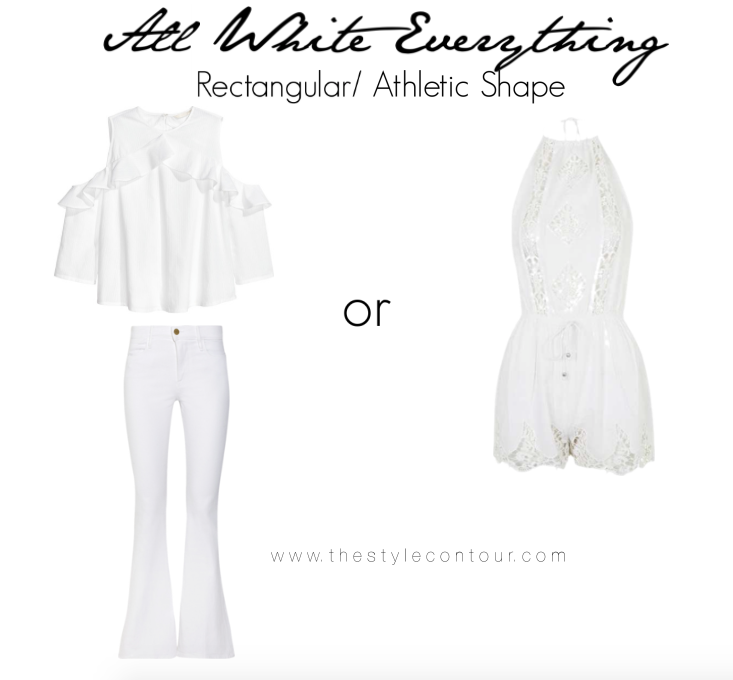 I hope you found this post helpful in creating your #AllWhiteEverything outfit this summer and hopefully with ease and confidence, which is always key! If you don't know which body shape you are, watch my video, How to Measure to Determine Your Body Shape, so I can help! If you did find this post helpful, please share it with someone you know who would, too!